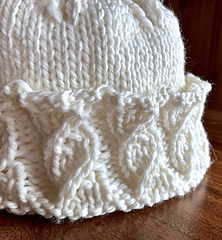 A pretty faux cable rib brim. And, one more, the top is closed in 2-tiers to keep the amazing texture. 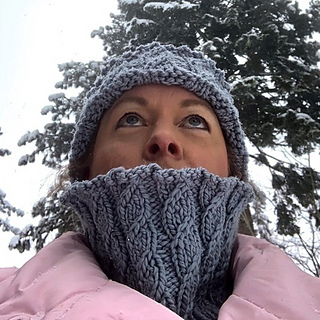 There is also a matching cowl with a decorative bind off that uses up the yarn for the 2nd skein needed for the Medium size hat. The hat is stretchy so the real determination of size is in the height. 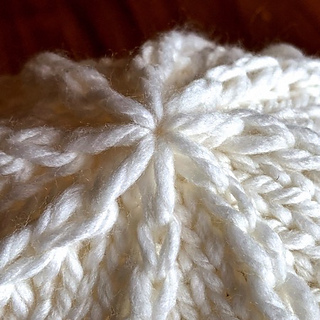 Small: (white) knit on US 8 used 1 entire skein (127 yds). The width fit multiple people but some needed a longer length to cover their ears. 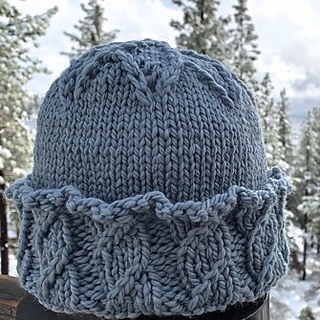 Medium: (blue) brim and rib knit with a US 9 (5.5 mm), the top on a US 8 (5mm). This give the base more room to stretch but it uses just over 1 skein (136 yds) which drives me crazy so I added a bonus cowl pattern to use up the yarn. You could knit 2 hats with 3 skeins. 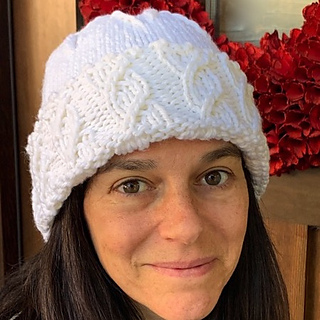 Cowl is designed to use up extra yarn from the 2nd skein required for the medium hat. One Size: 21” circumference, 6.5” height. Cascade 128 Superwash: 100% Superwash wool, 128 yds/100g skein, label gauge 3.5 sts/1” (14 sts 4”/ 10 cm) on US 10 (6 mm). 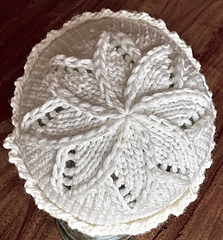 Knit to 4 sts / 1” on US 8 (5 mm). Alternative: chunky Alpaca yarn like Plymouth Baby Alpaca Grande. Only has 110 yds per skein so 2 required for all sizes. There are video tutorials available for these techniques on our You Tube Channel. The blog has multiple blog posts with more information about the Showy Decrease and all the ways to use it. There are more photos, information and links in the blog announcement that you will find helpful. 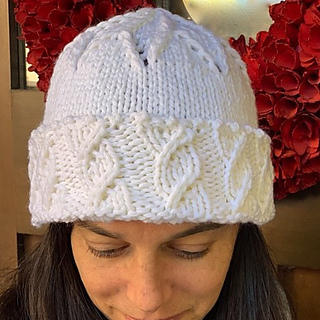 I’ve made this pattern free specifically so you can try out all these new techniques on a small project and then use them elsewhere in your knitting. They’re fun, I hope you’ll give them a try. Errata: Page 3, Cable pattern line 3: k2, sl1, k1, p2 . The chart is correct. 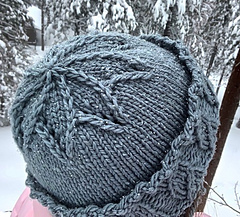 There was an extra knit st in the written st pattern. New file uploaded.